with host Suzanne Woods Fisher. our lives, our faith, our hopes and our dreams. Our prayer is that others be encouraged and blessed. To honor a special birthday today - or tomorrow (born February 29th) I decided to post a birthday cake my mom used to make. She usually filled it with a chocolate or vanilla pudding, but in her instructions to me, which I wrote down as a teen, she gave the option to fill it with pudding or fruit. Grease an 8 inch springform pan. Dust lightly with flour and tap to spread. You can also use two greased 8 inch pans - lined with wax paper and greased again - before dividing the batter. In mixing bowl, mix sugar and egg yolks well. I like to use a wooden spoon. Add liquids. Stir in combined dry ingredients. Stir in about 1/2 cup of the stiffly beaten egg whites, then, using a rubber spatula, fold in the rest to make a light fluffy batter. Pour into pan/ pans and bake at 325 F, 40 - 45 minutes or until golden on top. Less time if using two pans. Run a knife around the edge and let cool for 10 minutes before removing rim. Once cooled, cut through the cake, using a serrated knife. Beat whipping cream, adding optional vanilla pudding powder near the end to stabilize. 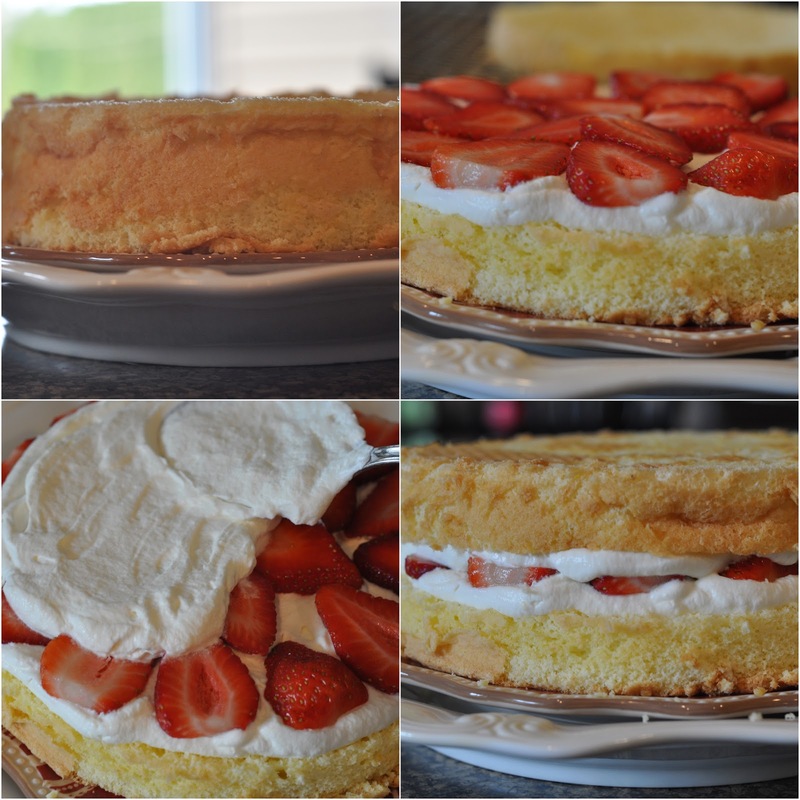 Layer half the whipping cream on cake, followed by a layer of strawberries and the rest of the whipped cream. Add top cake layer. In small pot, over medium heat, bring water and sugar to boil, stirring until sugar dissolves. While it continues to boil, beat egg whites in a heat proof mixing bowl until almost stiff. Boil sugar and water, stirring once in a while, for about 4 - 5 minutes or until clear and syrup like. It will be very bubbly. (Reading 240 F using a candy thermometer) If you do not have a thermometer it's okay.You can test for when it's ready by dropping a drop off the spoon into a cup of cold water. It should turn solid. Slowly and carefully pour syrup into beaten egg whites, with mixer going medium to high. Beat for about 3 minutes. Add cornstarch and lemon juice and beat another minute. 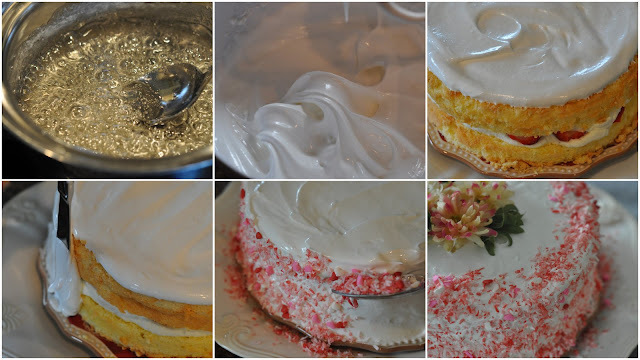 Spread on top and sides of cake. Sprinkle immediately with toasted coconut and almonds or colored coconut or leave as is. To color coconut, drop about three drops of food coloring into a large jar. Add 1 Tbsp of water and 1 cup of shredded coconut. Shake and adjust to personal preference. Add more coconut to lighten and more color to darken. I'm hoping that the pictures show you that this is not difficult. The cake is easy to mix. It may fall slightly after taking it out of the oven, but that's okay. The meringue frosting is easy but needs a bit of patience. If you don't cook the syrup long enough before adding it to the meringue, it will not stiffen up. Keep beating longer if peaks do not form after three minutes. If you cook it too long the texture of the frosting will be grainy. My friend Jane from work gave brought these little treats to work some time ago. They are a perfect 2-3 bite size homemade chocolate bar. Simply delicious. Cut chocolate bars into small pieces. Place them into a heavy bottomed medium sized sauce pan. Add butter, and melt over medium heat until melted and smooth. Immediately stir in rice krispies. Pour mixture into a butter greased 8"x8" pan. Melt together chocolate chips and second amount of butter until smooth. Quickly spread over mars bars. Place in refrigerator to set. Cut into small squares and store in a covered container in refrigerator. They freeze well up to 3 months in a well sealed container. Comfort food at its finest! 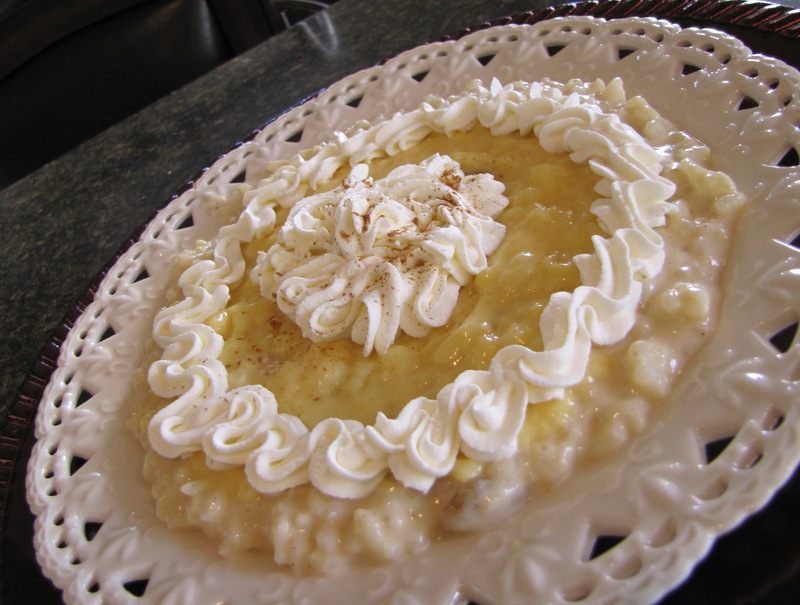 Many years ago a local restaurant chain had a deluxe rice pudding on the menu. It came served on a very large platter...a warm rice pudding, smothered with a vanilla custard and topped with whipped cream. My daughter and I reasoned that if we shared the dessert it was almost a healthy choice. And so our shopping trips often included a stop at that particular restaurant for a treat. It was a sad day when we found our favorite item was no longer on the menu. Several years ago, I made up a copykat version at my daughter's request. Since that time a rice pudding party has become an annual tradition...always in February. Our pudding day 2013 has come and gone... with four 'girls' around the table. We each had our own big serving and we didn't need dinner that day! Bring to a boil over medium heat, while stirring. Reduce heat and simmer gently for about 45 minutes (or until rice is cooked) stirring frequently. In a small bowl, combine egg, sugar, cinnamon and nutmeg with a whisk. Stir 1/2 cup of the cooked rice into the egg mixture...then add the egg/sugar mixture to the cooked rice. Cook on low for two or three minutes. Cool slightly and serve warm or chill in the refrigerator and serve cold. It is delicious either way. *If you have a double boiler, the simplest method is to cook the rice in the top of the double boiler over boiling water. This takes a little longer but reduces the risk of scorching the rice. Prepare your favorite vanilla custard. Whip up a pint of whipping cream, slightly sweetened and laced with vanilla. Spread a layer of rice pudding on dinner plate or platter. Top with a layer of vanilla custard. Garnish liberally with whipped cream. Indulge in rice pudding deluxe! I've been adding this dark green leafy and very healthy vegetable to our plates. No one is complaining about this new addition to our meals. There really is no recipe...just follow the simple steps below. 2)To remove stem from Kale, hold end of stem in one hand and pull down along stem with other hand. Leaves will pull away nicely from the bigger centre stem. Discard large stem. 2)Add several inches of water and 1 slice of lemon to a low pot that has a lid. (if doing a large amount of Kale add an extra slice of lemon) Place cleaned and stemmed Kale into pot. Place lid onto pot. 3)Place pot with Kale over high heat and allow to come to a full boil. 4)Turn burner to low and allow Kale to steam. Lift lid every couple of minutes to turn leaves, making sure that all the Kale leaves are all softening. Do this until Kale is bright green and soft....but not limp. It only takes 5-8 minutes depending on how much is in your pot. It's better to serve it a bit firm rather than limp and soggy. 5)Drain well, discard lemon and serve. An extra squeeze of lemon and a dash of lemon pepper really adds a nice finishing touch. It was back a few years when I walked into my favorite shop. My eyes spotted this sketch and stayed glued for awhile. It had my name written on it. Tears started rolling down my face. This motto represented my heart. I had taught this to my children, the best way I could. I watched my older daughters make some choices. to serve and support the needy children of Camden. helping families recover from the earthquake-torn country. It tugged at my heart as I saw them moving ahead with hearts for service. my daughter turned to me and said. "Mom, you always told us that you wanted to give us roots and wings." Little did I know what that meant. I too have wrestled with these questions concerning letting go. wings lift children upward and inspire them to soar freely, strongly and close to God. so they can seek God's will for their lives. Letting go does not mean abandoning them, but it means to give them back to God. It means to release those controls that are stirred up from needless fears. when it's capable, it finally flies away, strong and free. that God too, will be there to help our children reach their potential. Many of us have had to let go...cutting ties, pushing off and stirring up the eagle's nest. It truly is a process as we learn to give our children independence. We want them to serve God - not us. We want them to depend on God - not us. We also want them to know that God will always be with them. This is how Saturday used to look in my kitchen. After 37 years of working in this kitchen, we have taken the plunge into demolition and renovations. I can hear the groans and feel the shudders of those of you who have been this route and lived to tell about it. Tales of microwaves in the laundry room, TV dinners and barbequing in the rain. washing dishes in pails, and dust over everything. Yes, it's all true, but a beautiful new kitchen will emerge from the dust and chaos and I'm holding on to that. So where am I cooking this Saturday morning? Here - in our cozy camper parked beside the house. We cooked and ate our meals in this camper for 7 weeks a few years ago as we traveled across Canada from West to East and back again and we figure we can do it again over the next 2 or 3 months. between the house and the camper. If we lived near Betty and Charlotte this winter, we'd be microwaving in the laundry room for sure! I just don't have access to all my pans and gadgets. But I have already baked Cherry Platz and made a hearty soup, proving that you don't need a large, perfectly equipped kitchen to put good food on the table. Small and simple is just fine - fewer dishes to clean up for one thing! Saturday in Bev's NEW kitchen. Something I use to order quite regularly when we went out to eat was Eggs Benedict - but Celiac put that on the taboo list. I knew the English Muffins were a given to be made with wheat, but I was surprised to learn that Hollandaise sauce in a restaurant is made from a mix containing wheat flour. No problem -- I just make it all gluten-free and I can again enjoy one of my favorite meals - Eggs Benedict with fresh fruit on the side. The extra work is worth it ! Mix sugar and gelatin, add warm water and yeast and proof. Add proofed yeast and mix. Blend together dry ingredients and add all at once to liquids. Mix on low, then beat on high for 2 minutes. Divide batter between 9 - 3" English muffin rings (or make your own with folded parchment paper) placed on greased cookie sheet. Bake in 350 degree oven for about 25 minutes. Enjoy same day or freeze. Put a couple of inches of water in a saucepan and bring to a simmer. In a bowl whisk the egg yolks and the water . Continue to whisk until the egg mixture begins to thicken. Remove from heat ... and continuing to whisk, very slowly add the warm clarified butter. The sauce will continue to thicken. 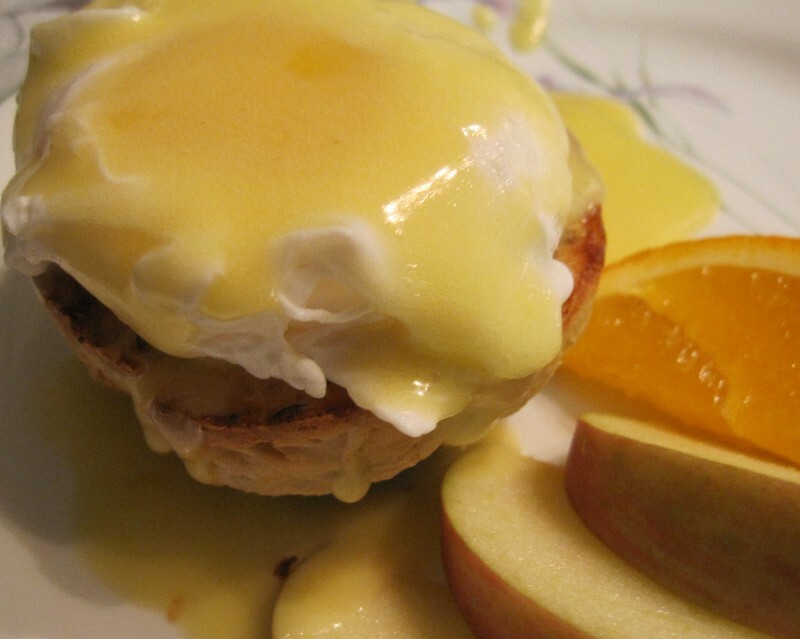 This is a lovely Hollandaise sauce that does not separate. Poached eggs - to poach eggs bring water to a soft simmer in a saucepan, with 1 tbsp of vinegar added to the water. Break the eggs and slide gently into the water. Let them cook until the yolk is almost set -- about 3 minutes. Lift them out of the water with a slotted spoon. Cut an English muffin in half, toast and butter. Add the poached eggs on top of the meat. Drizzle Hollandaise sauce generously over top. Arrange fresh fruit on the plate. Recently I put these sandwiches together for two of us. I had an idea of what I wanted and used what I had in the fridge. A nice change to the ordinary. Spread one side of open rolls with dressing and top with a few thin slices of roasted pepper. Place a few thin slices of chicken on the other side. Bake in 400 F oven for 5 - 10 minutes, until cheese melts. Top with sliced avocado and spinach leaves and enjoy! What do you do when you have guest for dinner? Do you make the entire meal or do you ask them bring something? It varies for me. Sometimes I like to do the entire thing, and sometimes the guests contribute. That way we share the cost and preparations to ease the event for the hostess. I love that our friends enjoy contributing to that kind of dinner. It sure makes it easier, and they know that when it is their turn to host, we all bring something in return as well. My cousin Doris brought this delicious cheesecake for dessert that I just had to share with you! Next time you are asked to bring dessert somewhere, consider this Apple Crisp Cheesecake. Mmm,so good! Thanks Doris. Beat the butter, sugar and vanilla until smooth and creamy. Pat the dough on bottom and 1" up the sides of a 9" spring form pan. Beat cream cheese and sugar until well blended. Add 1 egg at a time beating after each egg addition. Add vanilla beat again mixing well. Layer the raw apples over the cream cheese filling. 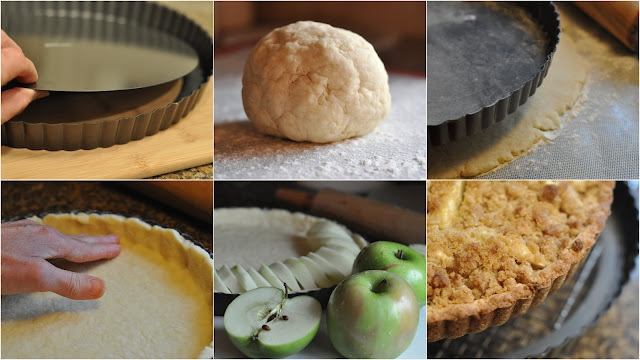 Combine ingredients until crumbly and sprinkle over apples. Place the spring form pan on a parchment lined cookie sheet for easy clean up. Bake at 450 for 10 minutes. Reduce temperature to 300 and continue baking 1 hour longer or until golden brown. Are you familiar with Tomatillo's? I admit I didn't actually start cooking with them until recently. I don't know what I thought green (verde) salsa was made of since I had never bothered to read the label. It might just have been me...but now I know. After trying a Pork Stew at our favorite mexican restaurant I asked the waitress what exactly was in the stew and I knew then I would be looking for tomatillo's next time I bought groceries. I don't have the nutritional values of this meal but the ingredients in the stew were healthy and low in fat, high in protein and rich in nutrients. The stew has plenty of sauce which works beautifully with steamed rice. I put the finished photo of the dish last because it isn't the most attractive looking sauce but wow...it is delicious. If you want the meat to be less like pulled pork, simply stop cooking it sooner. In a large dutch oven, heat pan over medium high heat and oil. Add and brown pork in batches, removing to a separate dish as it is browned. Remove all the meat, add onion and garlic to pan and stir fry until tender. Add seasonings, pork and 1 carton chicken stock and simmer 30 minutes. Dice tomatillos and place in blender with cilantro. Puree until smooth. Add to pot with peppers. Place in a 325 oven uncovered to reduce the sauce for 3-4 hours. Serve with rice, salsa, guacamole and green salad. Tip: If you want to serve the Pork Chili Verde in soft tortilla shell, keep the meat firmer. Add more chicken broth as needed. about reunions being the best kind of celebrations! We wish we could make all of you winners of the book! looking forward to her son's high school graduation this year. We will need your contact information. we do not hear from you. Mix all ingredients, except cheese. Divide into 8 balls. Squeeze a piece of cheese into each, shaping well around it. Place meatballs on parchment paper lined pan. Mix glaze and coat meatballs. (you can refrigerate at this point for several hours. Bake at 350 F for 30 minutes. Serve with wild rice, macaroni and cheese or scalloped potatoes and steamed vegetables. Happy Family Day to those living in Alberts, Saskatchewan and Ontario! and for some, it was just as they had hoped and for others there is a big sigh of relief that it's over for another year. I would like to share with you one of my favorite quotes on marriage and our responsibility in it. 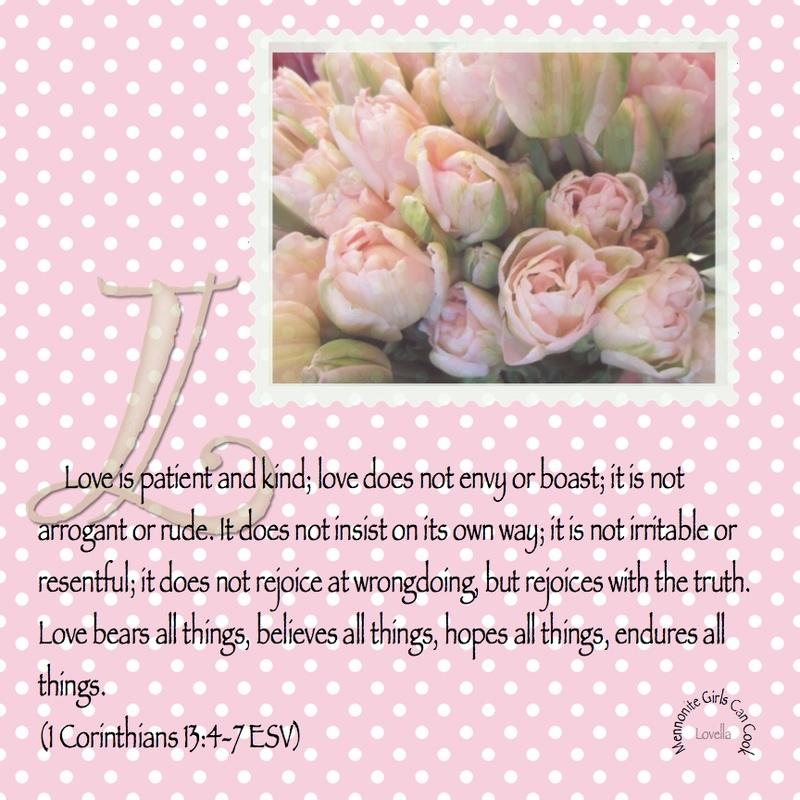 At first glance Bonhoeffer's quote may seem like a set of values from another place in time but I find it has a message that is timeless and if applied is powerful to make our marriages noteworthy and inspirational. Dietrich Bonhoeffer was a German Lutheran pastor, put into a Nazi concentration camp during World War II for his staunch resistance to Hitler and his genocidal persecution of the Jews. He was executed by hanging shortly before Germany surrendered in 1945. During his time in prison his niece was married and if he would have been able he would have taken her wedding ceremony. His sermon was smuggled out of prison and read out loud at her wedding and I share a short portion with you here today to perhaps challenge your thinking on marriage and to encourage you to see your responsibility in your marriage in a new way. If you are in the planning stages of your marriage I would encourage you to seek a godly marriage course that will get you off to the best possible start. 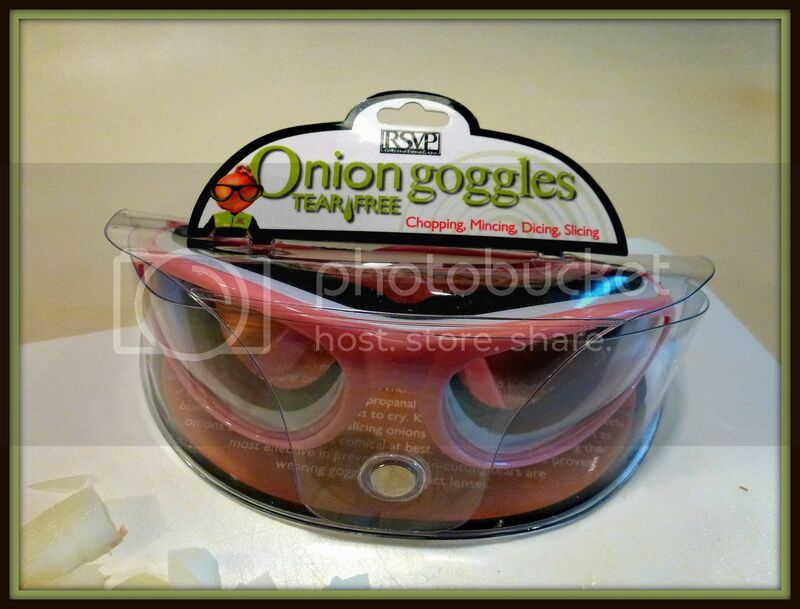 Have you seen or heard of Onion Goggles? At one of our cooking demonstrations at Lepp Farm Market I spotted them and decided to buy 2 pairs. I am so pleased with how well they keep me from tearing up while chopping, mincing, dicing, and slicing onions! 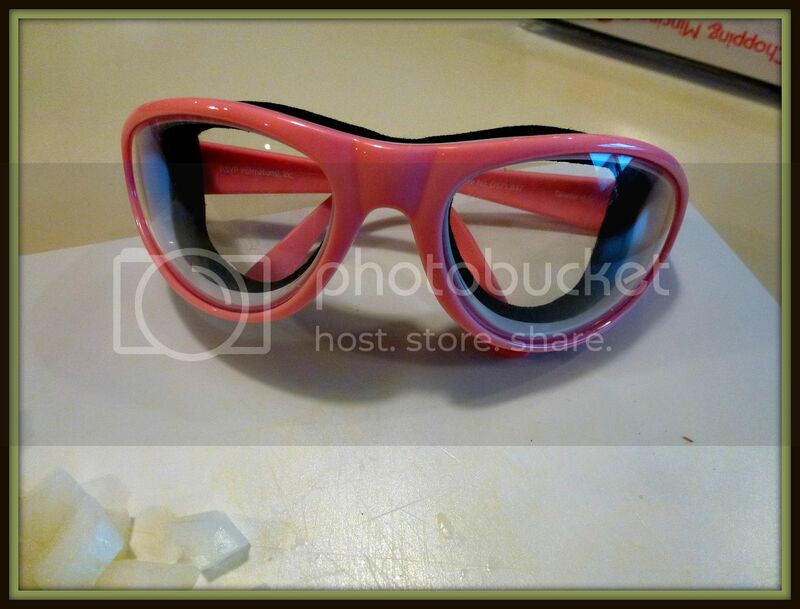 I highly recommend these glasses to anyone who loves to add onions in their recipes. 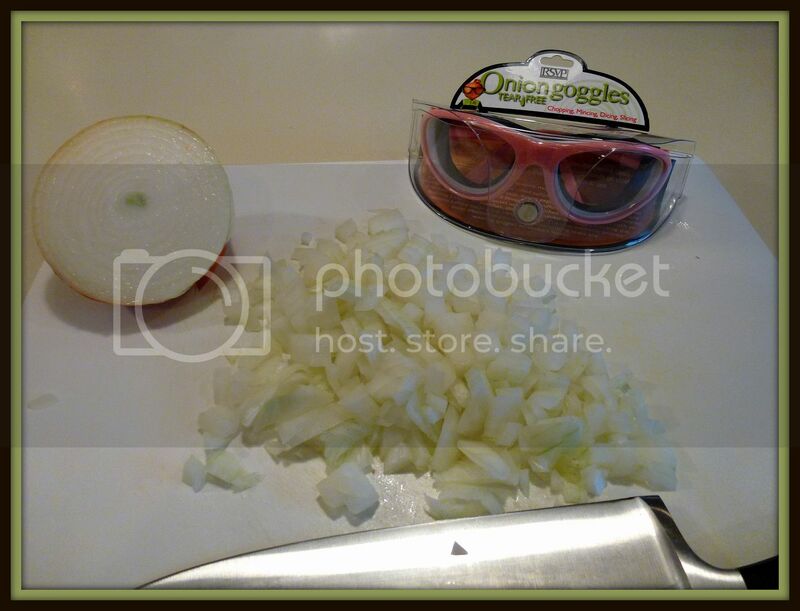 We love the flavor that onions add to dishes so I do a lot of chopping in my kitchen. 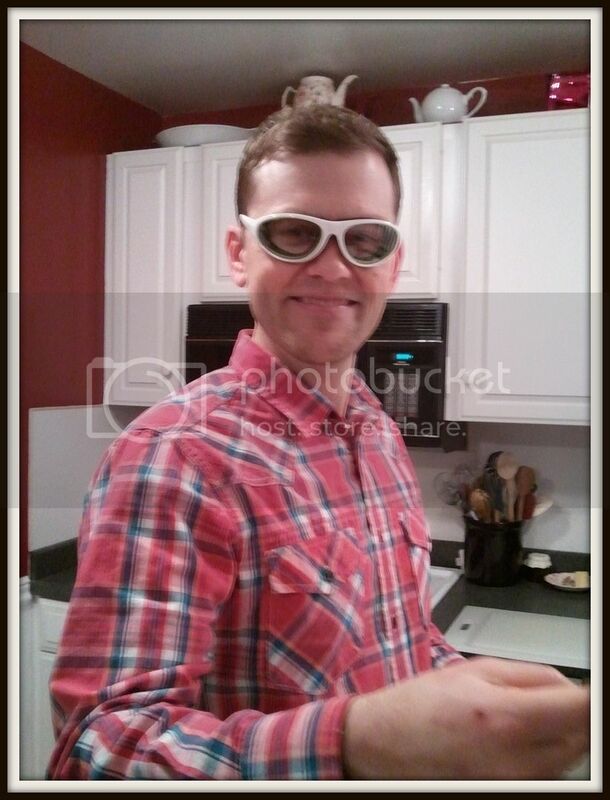 The next photo shows who I bought the 2nd pair of onion goggles for and he was happy to model his and send me a photo! Our son Josh who is enjoying his onion goggles, too. 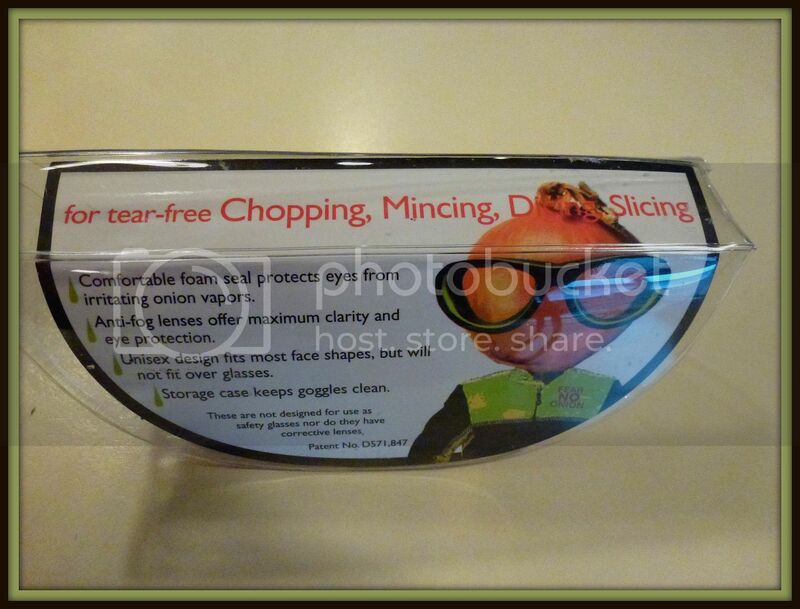 You can check Lepp Farm Market to see if they are still stocking the goggles. If they aren't find out where you can purchase them by googling onion goggles! We are very excited to announce that our new book Celebrations due to be published May 2 is now available for preordering. We have just finished proof reading and have seen the beautiful pages in their design and can hardly wait to share it with all of you! 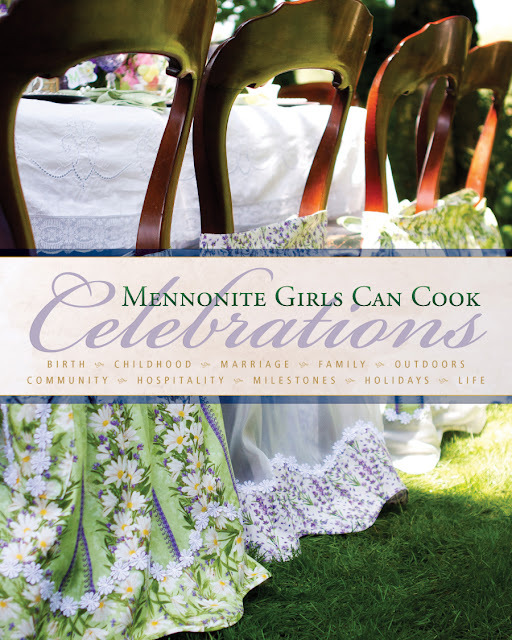 Celebrations is filled with recipes and stories that honor all of life. From tender mini-muffins to an elegant egg souffle roll to campfire cookout meals and ideas on what to bring to someone who needs a meal of comfort. We've included our favorite family meals that are sure to please and recalled the recipes that make children of all ages smile. We have included tips on how to make hosting guests in your home a simple and stress free event and special ideas on making milestone events an occasion to remember. We've put our heads together and each come up with something that is a must serve for our holiday menus and came up with our most commonly requested recipes to bring to a potluck. 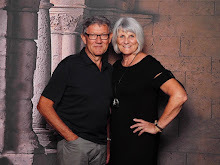 As in our first book we have once again shared stories of how the ten of us celebrate all of life's events and offer inspirational thoughts that reflect the same themes. With over 300 pages filled with photos, recipes and stories we hope that you will once again feel compelled to share it with family and friends. The royalties will be designated to the WASH program in Africa. We are most grateful to all of you who have encouraged us in so many ways. For those of you who have been eager to order your book the online retailers are ready and now prepared to take your order for delivery the beginning of May. Check here for your favorite online site. Look for it at your a retailer near you May 2. To launch the celebration we are offering two chances to win a Celebrations book, one here and one on our Facebook page. Leave a comment telling us which celebration you most look forward to. Share our give away on your own blog or Facebook pages and with your family and friends. We'll randomly draw one winner here and one on our Facebook page. Contest closes Sunday morning 4 AM PST. Welcome to my kitchen table on this Valentines Day morning. We enjoyed this breakfast on Monday, which was Family Day here in BC. My husband was most impressed by the high inflation of these orange zest infused individual puff pancakes, filled with fresh sliced strawberries and a dusting of powdered sugar. Served with warmed maple syrup and my homemade Blackberry Syrup, it was a sweet treat. Do something unexpected for someone today......just because you care. We all could use a touch of love where nothing is expected in return. Pre heat oven to 425º. Add eggs, milk, flour, vanilla, orange zest and salt into a mixing bowl. Whisk to combine. Place butter into oven proof glass pie plates. I used two individual 7"pie plates that are 1 1/2" deep, but you can use one 9" or 10" pie plate. If using two, place 1 tablespoon butter in each. If using one larger pan put all the butter in the pan. Once the oven is up to temperature, place pans with butter in oven until butter is melted and small bubbles begin to show, but don't allow the butter to brown. It will melt quickly. As soon as the butter is melted quickly pour your pre mixed batter into the pans. Do not stir. Close the oven door.....and do not open for 18 minutes. Turn on the light and watch as the pancake begins to rise up....but please listen...DO NOT OPEN THE DOOR TO PEEK...THE PANCAKE WILL FALL. Through the window of your oven door you will see it become golden brown as the sides puff up and there will be a deep hollow in the centre, creating a bowl. It's beautifully baked through when it's done. The bottom is very thin, and the sides will be thicker and done to perfection. During the last few minutes of baking I put my plates into my warming oven. These pancakes cool off fast, so it's nice to have a warm plate to serve it on. Fill with fresh cut strawberries or a mixture of any fruit. Peaches, raspberries, blackberries and blueberries are some of my favourites. Dust with powdered sugar and syrup on the side. As shown I made individual which are served whole. If you make it into one large pancake, cut and serve in a wedge. If you have small stoneware ramekins that are approximately 5" round and 1 1/2" deep you could use those and get 4 small individual puff pancakes from this recipe. Here's a peek right after they came out of the oven. See how they have pulled away from the pan. There is not sticking. 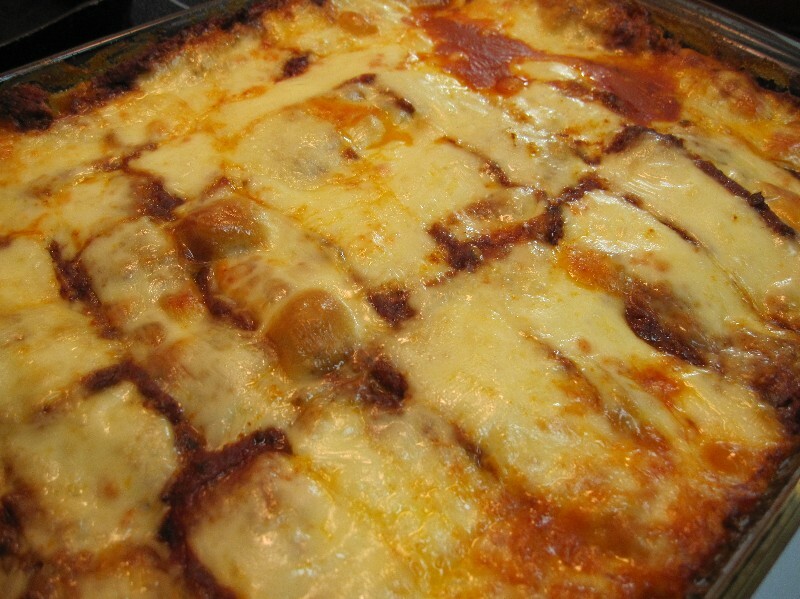 When I had to eliminate gluten from my diet (as well as for my daughter and granddaughter) I was very relieved to find that my Lasagna recipe did not need to change. All I had to do was exchange the wheat lasagna noodles for gluten-free ones and there is no perceivable difference in preparation or in the eating of it ! My favorite gluten free lasagna noodles are the Kinnikinnick ones -- either regular or brown rice ones. If you are cooking dinner for someone who has Celiac or simply gluten/wheat restricted this is an easy meal to make .. all you have to do is buy the gf noodles. Serve it with a salad and dessert and everyone is happy! In heavy roasting pan cook onions and celery in oil until cooked but not browned. Add beef and cook stirring until meat is no longer pink. Add remaining ingredients mixing well. Cook covered in 325 degree oven for 2 1/2 - 3 hours - it will be nice and thick. Sauce can be used immediately or frozen in containers for future use. I don't precook my lasagna noodles but if you prefer to cook them, do so according to instructions on the box. Spread 1/2 of noodles in baking dish. Cover with half of the meat sauce. Cover lightly with a layer of tinfoil and bake for 45 minutes at 350 degrees. I came across some lovely fresh green beans at the market the other day and had a craving for the Chicken and Green bean dish our local Chinese restaurant makes. however it was delicious and my husband suggested I share my version with you. Place chicken in small bowl and toss with soy sauce. Let sit for 15 minutes. Place 1/2 cup cornstarch in a plastic bag. Drain beans and plunge into cold water. Drain and set aside. Drain chicken and drop several pieces at a time into the bag with the cornstarch. Shake until chicken is coated and repeat with remaining chicken. Heat 2 tablespoons oil in a skillet and when it is hot, fry half of coated chicken pieces with 1/2 of the sliced garlic. Do not crowd pan. When chicken is done (cut into one piece to check for doneness) remove from pan to a plate. Add more oil to pan if needed and repeat with remaining chicken and garlic. Add honey, soy sauce, oyster sauce, rice vinegar and 1 cup chicken broth to the pan with the fresh grated ginger. Simmer briefly to blend flavours. Mix 2 teaspoons cornstarch and remaining 1/4 cup chicken broth and add to sauce gradually until sauce simmers and thickens slightly. Add chicken and green beans, cooking just until heated. 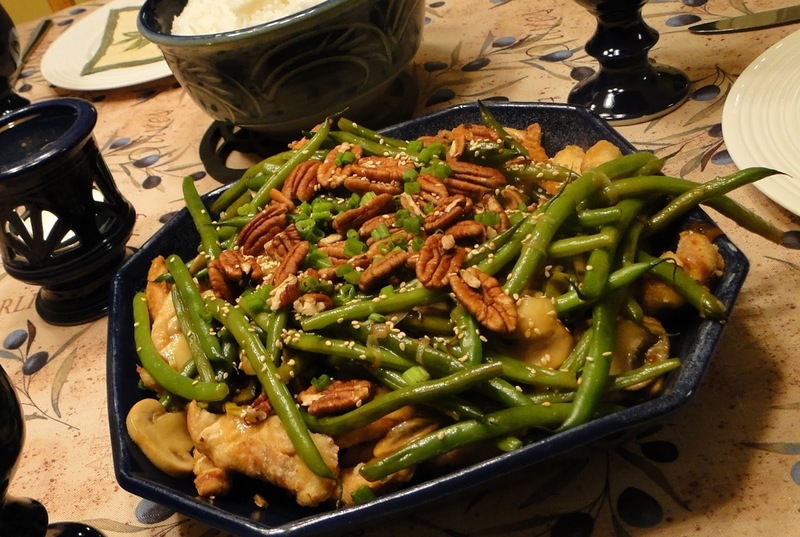 Remove to a serving platter and top with pecans, sesame seed and chopped green onions. Frozen Halibut portions make a quick dinner with fresh veggies and pasta. yet light enough to give a hint that spring is coming! Place halibut fillets in a greased (use 1 tbsp butter) baking dish and salt and pepper each piece. Slice half the lemon and lay a slice over each piece of halibut. Bake for about 20 minutes or until fish flakes easily. While the fish bakes, melt the remaining 1 tablespoon butter in a skillet over medium heat. Add the vegetables (except the spinach) and seasonings and fry until just tender. Add the wine and the cream and the juice from half the lemon and simmer a few minutes to condense. Just before serving add 3 cups of spinach and stir gently until it has wilted. Place the halibut over some fresh spinach. Pour the sauce over the halibut and pasta. 'It's a Slow Fade' gripped my heart. The scripture verses from Proverbs 4:20-27 came to mind and I began to ask myself some questions. Am I being careful what I look at, and where I go? What are the gray areas in my life? Am I careful what I listen to and what I say? What about my thought life....my choices? In what areas of my life am I slowly fading? God's Word gives us some clear instructions on how to keep from fading and eventually crumbling in our walk with Him. He instructs us to read His Word. To guard our heart and our minds in Christ Jesus. To be careful with our words, our eyes, and our footsteps. We are instructed to stay away from evil. and remain on the pathway that He has set before us. Below are the words to the song 'It's a Slow Fade'. Ask yourself the same questions I asked myself. The photo above is my kitchen, but I don't want to tell you about my kitchen today. I want to reminisce about Saturday in my Mom's house when I was growing up. Saturdays were rigidly set as to Mom's order of things and 'Saturday work' followed the same routine week after week, year after year! Most Mennonite homes would have been much the same. Saturday was always a preparation day with Sunday in mind. The house needed to be cleaned.. top to bottom. Everything that could be, was dusted including the baseboards. I remember the baseboards being one of my first chores as a child and I remember crawling around on my hands and knees making sure they were all free of dust and every other week washed. Floors were scrubbed , and every other Saturday were also waxed and polished. Everything was tidied and put away. Beds were stripped and changed, every other week, ready for Monday wash day. Mom always baked white buns as well as pies, cakes, cookies or squares. 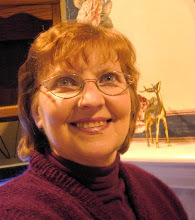 As I got older I was allowed to bake cakes or cookies but I never made or participated in baking the bread or buns. The noon meal for Sunday was prepared on Saturday so that when we came home from church, lunch would be ready. It was either soup or a cold meal such as potato salad and cold meat. Living on a small farm ensured there was always lots of meat -- our own beef, pork and chicken -- and vegetables either fresh from Mom's large garden or canned. The shelves in my Mom's well stocked basement pantry were filled with jars of jam, fruit, vegetables, a variety of pickles and sauerkraut. The baking was a must because you never knew who would be coming over on Sunday afternoon and would of course stay for Faspa -- a light meal of buns, meat, jam, pickles and baked desserts. It was accepted that Sunday afternoon everyone was free to just hop in the family car and arrive at family or friends' homes uninvited, yet assured of their welcome. Somehow, it wasn't too often that you arrived at someone's house and found that they had gone visiting somewhere else! Faspa was always served between 4 and 4:30 to make sure everyone could get to the evening church service on time. One of my Saturday jobs was to polish the shoes. I gathered up everyone's Sunday shoes and lined them up - six pairs. I so remember the white liquid shoe polish that was used on summer shoes. It had a particular smell and came in a bottle with a wand attached to the lid that was used to 'paint' the shoes. Paste was wiped onto the dark leather shoes with a rag and then polished to a shine. Saturday was weekly bath night and girls/women's hair put up in rollers or pin curls. Saturday night was late night shopping in town and you could always tell which women were going to church the next morning because they would have their hair in rollers under a scarf. I no longer hold to this rigid schedule of 'Saturday work' , but I do remember the feeling of security it gave me. It was something that remained predictable and constant throughout my growing up years and gave me a feeling of 'all's right with my world'. I found this Fruit Platz recipe in the Mennonite Treasury and thought I'd adapt it to fit into a tart pan. If you have never tried using one, this is a great recipe to try it with. The unique thing about this pan is that, once the cake is baked and cooled, you can push through from underneath and place the tart, along with the removable bottom, onto a serving plate. Grease and flour an 11-inch tart pan or a regular 9X13-inch pan. (tap to make flour disperse evenly)Preheat oven to 350 F.
Combine dry ingredients and cut in butter with pastry blender to make fine crumbs. In a small bowl, whisk egg, adding milk and then stir into dry ingredients with a fork. Gather together, pressing to shape into a ball. Roll out on floured baking mat or counter until an inch larger all around than the pan you are using. Roll up on rolling pin to unroll onto pan, or carefully lift into pan. Press up dough to make an edge all around. Make crumb mixture, using pastry cutter or fingers, squeeze to shape crumbs and sprinkle over apples/fruit. Bake for 40 minutes, until crust and topping is a nice golden brown. Serve plain, with whipped cream or ice cream. We have a bit of a Valentine's party with the grands over here every year. A favorite treat is always the Valentine popcorn, which is also easy to package in clear cellophane bags and tie with a red ribbon as a take-home treat. 1 cup pink and red Smarties or M&M's. Melt chocolate according to directions on package. Pour warm chocolate over popcorn and toss to coat. Add candies and stir well. *You can substitute white chocolate chips, but they must be of good quality or they will clump when melting. These are an easy blender version of potato pancakes that we enjoyed recently. Put all ingredients but the green onions into blender container. Cover and blend, stopping to make sure all ingredients are getting chopped. Push down onions or potatoes with a spatula if necessary. Continue till blended well. Some coarseness of the potatoes and onions is O.K. Pour batter onto hot greased griddle. Brown then flip once to brown the other side. We enjoy our potato pancakes with maple syrup or fruit syrup, also. I more often than not make my own salad dressings. I like being able to pronounce the ingredients that go into it. They are easy to make and cost effective too. On many occasions I have made a salad bar for supper for guests or just our family. Everyone can add their own choices, with several dressings to choose from. Creamy Garlic French is just one of them. 1-2 cloves garlic depending on the size of the clove and how much you like garlic. In a blender, combine the first 8 ingredients. With the blender running pour in the vegetable oil in a very slow thin stream. This process should take about 2-3 minutes, other wise the dressing may separate. This keeps for about 2 weeks in the refrigerator. Last Sunday there sat in the pew in front of me a mother with her very small child. The child grew sleepy and I watched him fall asleep in his mother's arms. Nothing to me defines peace, contentment, security and love as a baby asleep in their mother's arms. The world could be falling around them, but they have no fear, no worry -- they are safe. I thought of the disciples who one day embarked on a journey across a lake but were caught in an angry storm. The wind tossed their vessel to and fro, lifted the water into high waves that crashed over the sides of their boat threatening to sink it. The disciples, frantically baling water, struggled to keep their craft afloat fearing for their very lives. Yet... where was Jesus ? Right there in the boat with them but was He helping them ? No, He was fast asleep in the bottom of the boat enjoying the rocking motion of the sea. "How can you sleep ?? Don't you know we are sinking, don't you care we are going to die ?" But Jesus had no fear, no worry. He had been asleep in the arms of His father. No harm could come to Him. merely spoke His Father's words to the storm and it ceased. keeping us "safe from all alarms". "The Lord your God carried you, as a father carries his son, in all the way that you went." "I bare you on eagles wings and brought you to Myself." "Can a woman forget her nursing child ? .... Surely they may forget yet I will not forget you!" The words of an old hymn say it so well..
My kitchen cupboards are home to many pans of different shapes and sizes. Some of them were wedding gifts 35 years ago. I have pans that I inherited from the kitchens of my grandma, mom, and mom in law. They are well seasoned and bake beautifully. Then there are the new and used ones I pick up along the way. Fluted Flan Pans with removable bottom. I rarely bake up a flan but I do use these pans when I bake fruit platz, appetizer pizzas and foccacia bread. Pizza in a flan pan. I use the 24 cup mini tart pan for my Christmas Butter Tarts. They pop out perfect.....every time. I'm sure every kitchen has a regular muffin tin which is perfect for cupcakes as well. When I make a roast beef dinner I like to serve Yorkshire pudding, and having a Yorkshire pudding pan with it's deep cups makes for high inflation in the Yorkshires. I also use that pan to make mile high muffins. The little Hovis pans were a gift from our neighbours who used to own a Dutch bakery. I have a set of 6 of these and I like to bake loaf shaped muffins in them. These pans are not easy to come by, but if you ever find some it's worth the purchase. They bake wonderfully. Savoury Popovers in Yorkshire Pan. Bread pans. The ones on the left are from my mom and mom in law. The thin ones in the middle are from my Grandma Janzen. The Hovis bread pans were given to me by my neighbour as well. In the background, the dark small loaf pans are fun to use when I have a special dinner and place a small loaf of bread on a wooden cutting board for 2 guests to share. Add a little dish of whipped butter and enjoy. I have 3 sizes of the blue speckled enamel roasters. They are great for roasting chicken beef. They are perfect for baking a meat loaf or filling with cabbage rolls. The big shiny roaster in the back doubles as a chili, spaghetti sauce or soup pot. I like to bake potato or mushroom soup in the oven and this heavy roaster makes a big batch and there is no burning. My favourite.....my mom's old stained roaster. It's so well seasoned and turkey is always perfect when baked in this roaster. Many a Sunday lunch came out of the oven in this roaster during my growing up years. Do you still make a big lunch after church on Sunday? I don't too often anymore but maybe I should start again and invite guests. Big batch spaghetti sauce being made in a roaster. Spring forms, tube, bundt, rounds and squares. Try using your spring form for your next coffee cake. Also use it to bake up a layered veggie lasagna. When you open the spring the layers look really nice. Cut into wedges. Use your bundt pan for baking a wreath of sweet buns. And of course there are the pans for layered birthday cakes, angel and chiffon cakes.